Adobe Dreamweaver CC – is a powerful offline visual website development tool, the sphere of application of which goes down to the creation, publishing and further management of different types of websites and offline apps. The program is included into the Creative Cloud service, which makes it possible to enjoy the entire spectrum of its advantages. 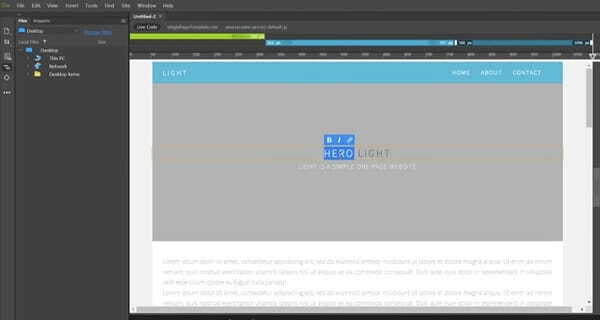 Adobe Dreamweaver has gained impressive popularity after Adobe announced the discontinuation of Muse support. As a result, web designers, who have got used to working with Adobe products (including Adobe Muse), have faced the necessity to look for a decent alternative to the system. Being one of the best Adobe products and one of the most functional tools, Dreamweaver has quickly become the tool to choose by professional web designers. Newbies, in their turn, can also use it, but comparing to Adobe Muse it will take some time to master and explore all the nuances of the software to launch even simple projects with it. If you have currently faced the same choice, Adobe Dreamweaver CC review will help clear out the major system parameters. Used to create websites and offline apps. Adobe Dreamweaver CC is quite easy-to-use. At the same time, however, it may seem somewhat complicated and puzzling for users, who have got used to working with standard online and offline website builders. As an offline-based software, the system requires preliminary download and installation. This doesn’t take much time, though. What you’ll have to do is to subscribe for the Adobe platform or specify the existing account data (if you already have the one) to sign in. Right after that, you’ll be asked to provide your level of web design proficiency, the niche you specialize in and the number of users, who will work on the project. This means that Adobe Dreamweaver CC makes it possible to develop individual projects and it also encourages for team cooperation. The latter option works well for web design agencies, who work on the creation of custom-made client projects. Right after you install the program, you’ll be redirected to the dashboard of the system, where you can start creating and customizing a website. You’ll be offered to pick a template from the extensive gallery of the system or opt for the “Quick Start” option, having learnt the tutorial for beginners and selected one of the available file types. If you have already worked on the project and saved it for further customization, you can open the file and keep editing it from the place you’ve stopped at. There are also multiple recommendations, tips and tutorials available in the “Help” section here. This will simplify the exploration of the system by non-techies. All in all, the dashboard of the service is quite understandable and logically-structured to let you start working on your project with ease. Easy-to-use yet implies coding knowledge. Adobe Dreamweaver CC is a website building software that comes with multiple design customization tools that range in complexity level and area of application. The system is quite flexible for proficient web developers, while beginners definitely need more time to learn all the intricacies of the service. What you should realize is that it is impossible to go without coding knowledge here as the software implies the use of programming languages. Let’s find out more about the major features of the system now. 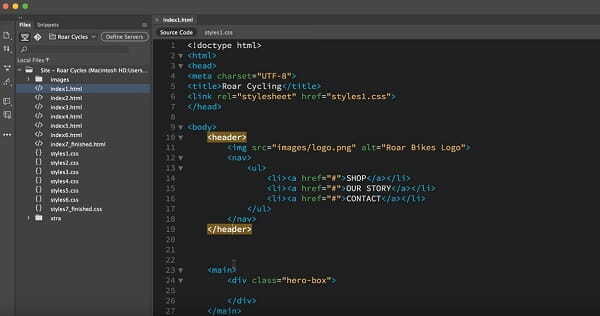 Working with codes is somewhat simplified in Dreamweaver as it comes with an automatic code completion tool, which writes the codes for you after you start adding them. That’s a beneficial feature for those users, who are not programming pros. The system is updated on a regular basis that helps improve users’ publishing, coding, website design and management expertise. The software lets developers launch websites and applications to fit various desktop and mobile devices. What you need is to code your project in the system and it will further display great across tablets, desktop computers and mobile phones with different screen resolutions and sizes. One of the highlights of the software is its extensive integration options. The system seamlessly integrates with other Adobe products, including those focused on the needs of web designers. This becomes possible in terms of Adobe Stock Marketplace and Creative Cloud Library integration. 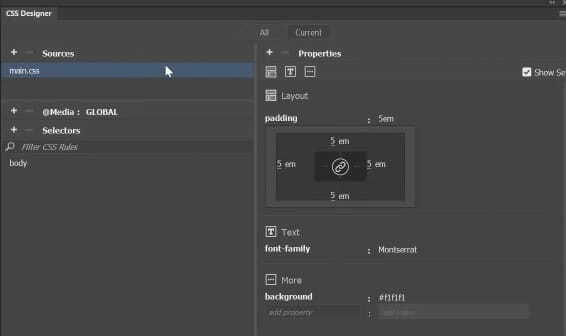 Thus, you can pick and integrate multiple Adobe products into your website, including Illustrator CC, InDesign CC, Photoshop CC, Premiere Pro CC, After Effects CC, Dimension CC and Animate CC and more. Apart from that, the system allows integrating some third-party systems and services like GitHub, Bitbucket, Business Catalyst and what not. Finally, Dreamweaver integrates with the latest Chromium Embedded Framework versions. This allows web designers launch HTML-5 compliant projects and display multiple CSS grids, Firefox elements etc. Dreamweaver comes with Bootstrap 4 support, which ensures better coding editing and application of visual tools to simplify the process of website creation. When reaching the extensive Adobe Stock Marketplace , you can browse a stunning collection of images and illustrations you can select and download to your projects directly from Creative Cloud. Batch content export from PSD files is also possible, which helps save time by using the photos from Photoshop documents, which are mobile-optimized by default and available in various formats and resolutions to ideally fit your project. Among the other notable Adobe Dreamweaver features, it makes sense to mention real-time browse preview, syntax highlighting and checking, availability of Typekit Marketplace, multilanguage support (English, Polish, Dutch, Swedish and Turkish languages), Adobe Edge web font choice, integrated Certificate and CMS support and more. Extensive integration options and Bootstrap 4 support. Adobe Dreamweaver CC offers an opportunity to download and install themes from other external resources. These samples are provided for free and for extra cost – it’s up to you to choose the option you need most. Dreamweaver allows integrating Joomla, Drupal and WordPress templates and it also comes with a grid-based system to create responsive layouts for all types of devices they can be viewed on. Giving preference to templates designed by third-party web developers, make sure you deal with a trusted seller to get the designs that won’t contain malicious codes that may pose danger to your website safety afterwards. The software allows for quick website publishing due to the availability of integrable starter templates that fit well various niches. Thus, you can easily launch HTML emails, blogs, eCommerce websites, landing pages, portfolios and other types of commercial and non-commercial projects with Dreamweaver. Integration of Bootstrap contributes to the creation of websites that dynamically adapt to fit the screens of different devices. Integration of Joomla, Drupal and WordPress themes. Adobe Dreamweaver CC offers several types of customer support options. There is a rich Help Center, where you can find answers to the most widespread questions regarding system use. Due to the convenient and time-saving search filter option, users may find the topics they are interested in by typing the corresponding search inquiry. The system will automatically sort out the answers. Adobe also grants access to Community Forums, which encompass multiple topics and discussions, where users share their experience and ideas on how to get the most out of the system use. What’s more, Adobe offers quality phone, ticket and live support. Even though, Adobe Dreamweaver CC is mostly oriented on experienced web designers, it pays much attention to the needs of beginners. The software offers a rich selection of tutorials, guidelines and manuals for all user categories. This is where they can find out more about the system implication, web development process, types of projects that can be launched with the software, the basics of web design and coding as well as special intricacies of the platform that might affect the result. There is also a Dreamweaver forum for beginners here. Adobe Dreamweaver CC doesn’t have an absolutely free plan, yet it offers a free trial that extends for 7 days and is a must for everyone, who plans to use the platform in future. As to paid subscriptions, the software has several personal and enterprise plans to come up to the needs, requirements and budget of all user categories. There are also separate plans for educational establishments, namely schools and universities. The Individuals Plan costs $29.99/mo ($239.88/year with the annual subscription) and grants 100GB of cloud storage space, personal portfolio website builder, premium fonts, social media tools and other advantages. The Business Plan costs $29.99/mo ($359.88/year). The cost of plans for schools and universities constitutes $14.99/month for each user, while the per-device license plan costs $155.88/year. Subscriptions for educational institutions come with Adobe License deployment and management feature, 100GB of cloud storage per each License, 24/7 tech support, individual access to product experts and other essential features. Rich feature set included into subscriptions. Adobe Dreamweaver CC is quite a powerful and feature-rich platform, which provides lots of tools and options for all types of users. If you still have any doubts regarding the choice possible of the system, it makes sense to specify its pros and cons, the number and correlation of which may help you make the unbiased decision. Here they go. Adobe Dreamweaver CC is a powerful offline web design tool, which comes with a visual editor and implies the application of coding skills. The software requires preliminary download and installation, which is quite a quick and simple process. The software works great for the development of different types of websites and it’s also a good choice for those users, who have ever worked with Adobe Muse and started looking for the Dreamweaver alternative after its recent discontinuation. Dreamweaver’s feature set is mainly geared towards proficient coders, who work for web design agencies or have enough skills and experience to create large-scale projects. Newbies will find the system perplexing and complicated, but they still can use it to develop small projects, following the guidelines and tips the system generates. All in all, Adobe Dreamweaver CC is a decent choice for those, who know how to make use of its abundant feature set. If you can’t boast programming knowledge, it makes sense to look for simpler alternatives like website builders that allow completing the same range of tasks and provide simpler and more convenient web design environment.